Stewart, J.d.m. and Mike Commito. 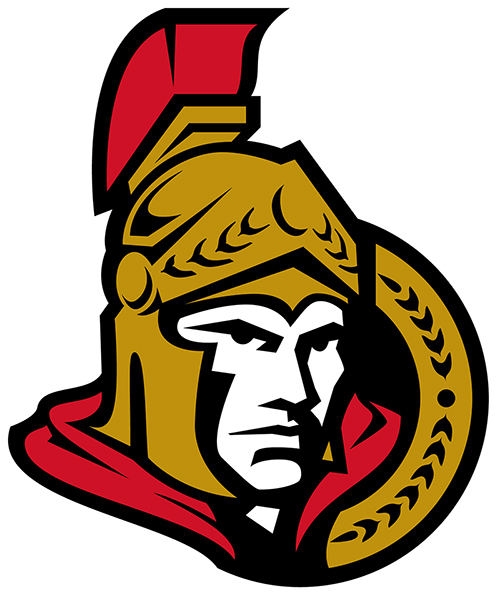 "Ottawa Senators". The Canadian Encyclopedia, 04 October 2018, Historica Canada. https://www.thecanadianencyclopedia.ca/en/article/ottawa-senators. Accessed 18 April 2019. 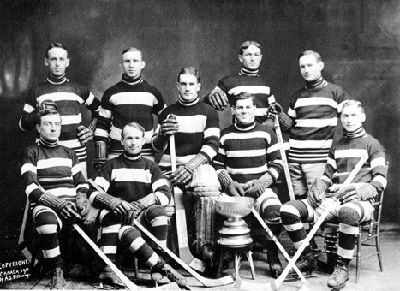 This 1923 team was one of 5 Ottawa teams that won the Stanley Cup (courtesy Library and Archives Canada). The first team to play professional hockey under the name Senators dominated the sport in the early 20th century. Known officially as the Ottawa Hockey Club, the team won the Stanley Cup	in 1903, 1904, 1905 and 1906 as the Ottawa Silver Seven, and won in 1909, 1910, 1911, 1920, 1921, 1923 and 1927 as the Ottawa Senators. The Senators were charter members of the original National Hockey League	in 1917, with key players such as Frank "King" Clancy, Cy Denneny, Eddie Gerard, Frank Nighbor and Art Ross (for whom the Art Ross Trophy	is named). 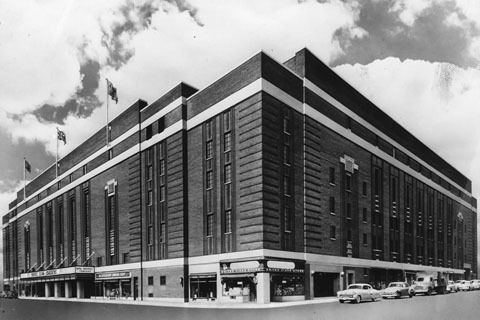 One of the first teams to suffer from the "small-market" malaise that now afflicts professional sports teams in Canada, the Senators began experiencing financial difficulties in the late 1920s as the NHL expanded into larger American cities. The most dramatic attempt to recover involved the sale of Clancy, Ottawa's most popular player, to the Toronto Maple Leafs in 1930 for two players and $35,000. The team suspended operations in the spring of 1931 and the league leased its players to the rest of the league. The Senators returned after a year of inactivity but in the fall of 1934, the team moved to St Louis, where it became the Eagles. The financial difficulties continued, however, and the team folded for good at the end of the 1934–35 season. The present-day Ottawa Senators joined the National Hockey League in 1992 as an expansion team, along with the Tampa Bay Lightning. The decision caught many by surprise as Ottawa was considered to be a small market. Like most expansion teams, they struggled in their first few seasons. After finishing last in the 1992–93 season with only 10 wins, the Senators used their first-overall pick in the 1993 NHL entry draft to select highly touted junior star Alexandre Daigle. A record-setting scorer for the Victoriaville Tigres of the Québec Major Junior Hockey League, Daigle turned out to be one of the biggest draft busts in NHL history and never lived up to expectations. After signing a rich contract he never scored more than 51 points for the Senators and was traded in 1998 to the Philadelphia Flyers. Under coach Jacques Martin, the Senators began the climb to respectability, making the playoffs for the first time during the 1996–97 season. The team continued to build on this early success and the following year, finished with more wins than losses for the first time in franchise history. In 1998–99, Ottawa finished first in the Northeast Division with 44 wins. While the team was swept in the playoff quarter-finals, their improvement in regular season play earned coach Martin the Jack Adams Award. The Senators continued to show great promise, led by rising young stars such as Daniel Alfredsson, Alexei Yashin and Wade Redden. Yashin was named team captain in 1998, becoming the first Russian to be a full-time captain in the NHL. Unfortunately, things turned sour for Yashin and the Senators when the star player demanded to renegotiate his contract. The club refused, and Yashin ended up sitting out the entire 1999–2000 season. During the dispute, he was stripped of his captaincy, which was then awarded to Alfredsson. In 2001, Yashin was traded to the New York Islanders for Zdeno Chara, Bill Muckalt, and a first round pick that the Senators used to draft future franchise player Jason Spezza. The Senators continued to be one of the NHL's top clubs in the early 2000s. In the 2002–03 season, they set franchise records for wins (52) and regular season points (113). As a result, the Senators earned the Presidents’ Trophy, awarded to the team with the most regular season points. It was the first time a Canadian NHL team had won the prize since the Calgary Flames in 1989. It was also Ottawa’s second division title in three seasons. In the playoffs, the Senators advanced as far as the Eastern Conference Finals, but fell to the New Jersey Devils in a hard-fought seven-game series. The Devils went on to win the 2003 Stanley Cup over the Mighty Ducks of Anaheim. Despite the team’s regular-season success, Ottawa continued to be stymied by the Toronto Maple Leafs, who defeated them four times in the post-season between 2000 and 2004. These playoff matchups contributed to the creation of a great rivalry in what came to be known as the "Battle of Ontario." After the 2004-05 season was cancelled due to a player lockout, the Senators made waves that following summer when they announced a blockbuster trade. On 23 August 2005, Ottawa sent Marian Hossa and Greg de Vries to the Atlanta Thrashers in exchange for highly touted sniper Dany Heatley. In his inaugural season with the Senators, Heatley scored 50 goals and racked up more than 100 points, becoming the first player in an Ottawa uniform to reach both benchmarks. With an array of talent, including stars such as team captain Daniel Alfredsson, Dany Heatley and Jason Spezza, the Senators made it to the Stanley Cup final in 2007 but lost to the Anaheim Ducks, four games to one. In the off-season, the club fired general manager John Muckler and replaced him with coach Bryan Murray (Murray had been the coach and general manager in Anaheim from 2001 to 2004). John Paddock took over as coach. The following year, Ottawa reached a milestone when it secured its 500th franchise win in a 5–4 victory over the Florida Panthers on 5 December 2007. Despite another solid regular season, the Senators could not replicate their playoff success from the previous year and were swept by the Pittsburgh Penguins in the Eastern Conference quarter-finals. By the start of the 2008–09 season, Craig Hartsburg had replaced Paddock as coach. However, as the regular season unfolded, the Senators struggled and in February, Hartsburg was replaced by Cory Clouston. The coaching change was not enough to right the ship, and the Senators missed the playoffs, ending 11 consecutive seasons of reaching the post-season. As the 2009–10 season approached, star forward Dany Heatley was acrimoniously traded to the San Jose Sharks. Despite having just completed the first year of a six-year contract extension worth $45million, Heatley had been unhappy with his role in the club and reportedly requested a trade. Although his departure undoubtedly left a sour taste in the mouths of management and fans, the Senators had a few bright spots that season, including a franchise record for the most consecutive wins (11), going undefeated from 14 January to 4 February. Trouble continued the following season (2010–11) for the team. After posting a record of 16–18–5 at the end of December 2010, management proceeded to trade away veteran players, including fan favourites such as Mike Fisher and Chris Kelly. At the end of the regular season, general manager Bryan Murray fired the entire coaching staff (Murray’s contract was extended for another three seasons). He then hired Paul MacLean as coach in advance of the 2011–12 season. During the 2011–12 season, the club celebrated the 20th anniversary of its return to the National Hockey League. To help commemorate the anniversary, Ottawa hosted the 2012 All-Star Game. With MacLean behind the bench the Senators returned to playoff form, qualifying for the post-season in each of the next two seasons. In recognition of his efforts, MacLean received the Jack Adams Award in 2013, the second time an Ottawa coach took home top honours. Daniel Alfredsson, Ottawa’s captain for over a decade, left the Senators in the 2013 off-season, opting to pursue free agency after failing to secure a new agreement with management. Alfredsson played the 2013–14 season with the Detroit Red Wings before retiring from professional hockey. He spent 17 seasons with the Senators, playing in 1,178 games and is the franchise leader in goals (426), assists (682) and points (1,108). Prior to the start of the 2014–15 season, Erik Karlsson was named captain, the ninth in franchise history. Ottawa faltered early in the season, leading to the dismissal of MacLean in December and the promotion of assistant coach Dave Cameron. Led by a strong performance from replacement goaltender Andrew “the Hamburglar” Hammond and rookie Mark Stone, Ottawa mounted an impressive late season run and advanced to the post-season. 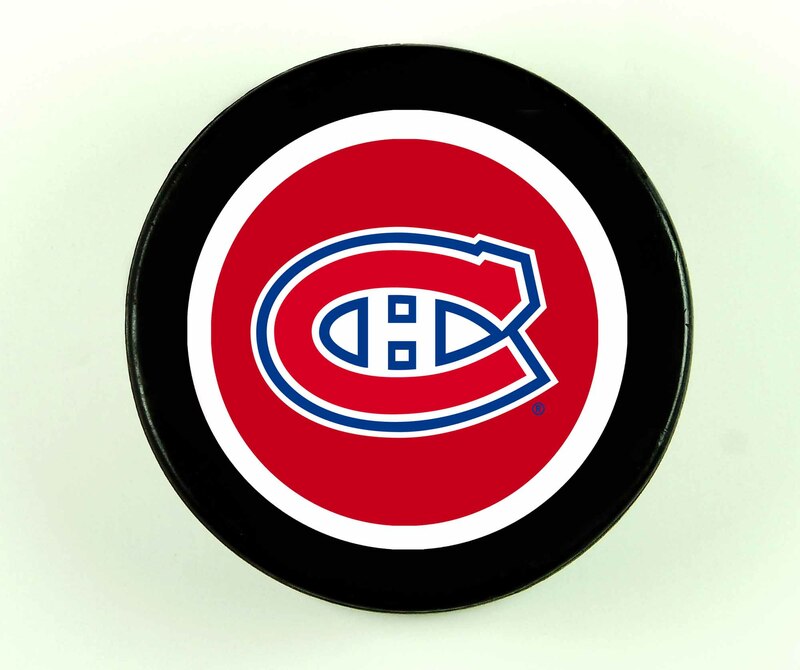 However, the team was eliminated in the Eastern Conference quarter-finals by the Montreal Canadiens. In the off-season, Stone was nominated for the Calder Memorial Trophy, awarded to the league’s best rookie, and Erik Karlsson took home his second Norris Trophy in four years. Ottawa’s late-season goaltending magic did not continue the following year. The Senators finished the 2015–16 campaign with 38 wins but allowed the third most goals-against in the league and failed to qualify for the playoffs. Not long after the season ended, Ottawa dismissed head coach Dave Cameron and later replaced him with Guy Boucher. In the front office, Bryan Murray, who had been the Senators’ general manager since 2007, stepped down from his position and took on a senior advisory role with the club, while assistant general manager Pierre Dorion was promoted. Ottawa finished the 2016–17 campaign with 44 wins, which was good enough for second place in the Atlantic Division. In the postseason, the Senators took the Pittsburgh Penguins to seven games in the Eastern Conference final but lost in double overtime. Despite narrowly missing a Stanley Cup Final berth, the Senators struggled the following season, winning only 28 games and finishing seventh in the Atlantic Division in 2017–18. Early in the season, the Senators acquired centre Matt Duchene from the Colorado Avalanche to bolster their offence and improve their chances at the championship. The trade was part of a three-team deal that saw Ottawa send goaltender Andrew Hammond to Colorado and centre Kyle Turris to Nashville. However, Duchene didn’t deliver the offensive advantage expected by the team, and inconsistent goaltending contributed to the team’s struggles. Off the ice, owner Eugene Melnyk drew the ire of fans. As the club prepared to celebrate the league’s centenary as part of the NHL100 Classic matchup at Lansdowne Park between the Canadiens and Senators on December 16, 2017, Melnyk put a damper on the festivities by taking aim at the fans for dwindling attendance numbers and even mused about the possibility of relocating the team. As the dismal season unfolded, the cantankerous owner’s relationship with the fan base worsened, and he became the subject of a campaign known as #MelnykOut, a movement dedicated to ousting him from the organization. Les Sénateurs d'OttawaSite Internet officiel du club de hockey Les Sénateurs d'Ottawa. Ottawa SenatorsThe official website of the Ottawa Senators NHL club.